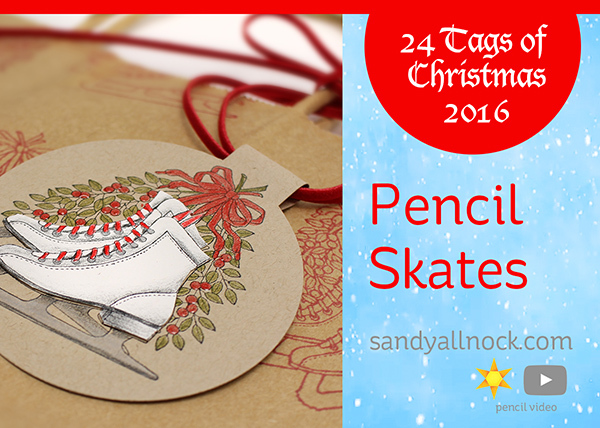 I originally planned a one-layer tag- using white pencil for skate highlights. Which would have worked. But then I realized that if I *only* fussycut the skates, the white could really pop! It’s adhered with just some stamp runner, or you could add dimension under it too. Watch the video below or click HERE to see it in HD on YouTube. The tag is loosely tied by letting a few spirals of ribbon pass through the hole at the top of the tag. The skates are just beautiful!! What a great job and the tag holder so creative!! As always Sandy u r so creative and talented!! I love these tags! I was younger I went Ice Skating all of the time. I was in an Ice Skating Show at the Rink in Newark, New Jersey. Such talent. Love all your tags. Beautiful tags!! I love videos- I always learn something new! Thanks for all you do! Very nice! I love the helpful hints you always include with your creations! Wow the layered skate sure makes a difference and in white. I love the soft pencil look. Awesome tag. LOVE,LOVE, these are so cute. I have a old ( really old, from the 50’s) pair of ice skates hanging in my living room, I think they are so cool. By the way, I LOVE your SAFETY pin, I wear one proudly every day !!!! So glad to see that on your blog. These are so lovely! I love the pop of white against the craft! Beautiful, perfect or my folks. They met skating. Loved them. What a great idea Sandy. i love these skate tags. Practical and yet so awesomely beautiful. My absolute favorite so far. I love all the tags but these are my favorite!!! So creative!!! Those ice skates look so very real. I always associate ice skates with Christmas. Favorite so far!!! I want to win these!!! I want to win these!!! 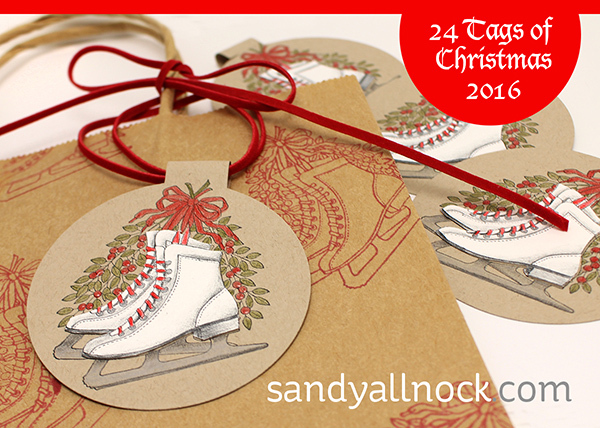 Fun tags ~ Love using Neenah Desert Storm paper. Too easy to get in a rut and always use white. Such beautiful tags! So inspiring!